Sometimes a tuner will go out of their way to keep a car quiet. As well as not sacrificing much (any) power, you also wind up with a car that refuses to drone on the freeway, doesn’t draw attention from the rozzers and is supremely neighbour-friendly. That hasn’t happened here. This thing is LOUD! But it’s not just decibels, it’s the quality of noise that gets your attention. Like, instead of just a blaring exhaust, the pipework on the Nissan GT-R is so overkill you can almost see down it as far as the turbos. And you can certainly hear each snail spooling up as you give the throttle a tickle. It’s just like the turbo-spool noise you get from the big Peterbilt next to you at the lights. It’s manic. It’s evil. It’s some kind of lovely. 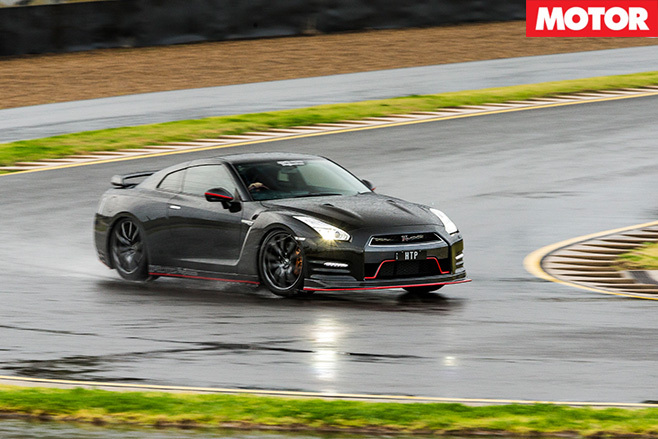 Of course, that evil noise is just a foretaste of what’s to come when you load her up, build some boost and rack off into the gloom of a wet day at Eastern Creek. If you’ve never driven a 10-second car, then it’s a bit difficult to describe what happens next. But take it as read that there’s plenty enough grunt to unhook each of the four sticky tyres as you bring the revs up. And that’s in the dry. In the wet, driving this car quickly became an exercise in keeping it on the island. That said, even in the streaming rain, provided you feed the power in, rather than just dumping a huge gob of throttle percentage on it, there’s some real grip; enough for you to rocket the thing forward and get a sampling of that 10-second potential. Until it gets really wound up, of course, at which point it’ll turn its tyres into paddles and it’s all over. Watching the Nissan GT-R blast off at the strip was laugh-out-loud stuff, but the resulting numbers reduced us all to schoolgirl giggling. 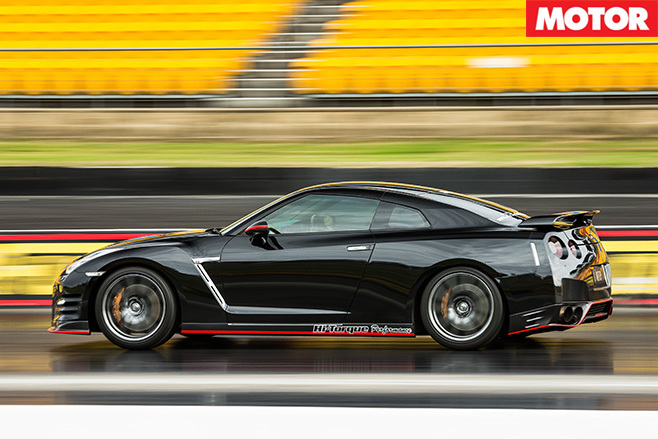 Even with ferocious wheelspin off the line, the R35 clocked 3.31sec to 100km/h and a 10.83sec quarter at 220.16km/h. 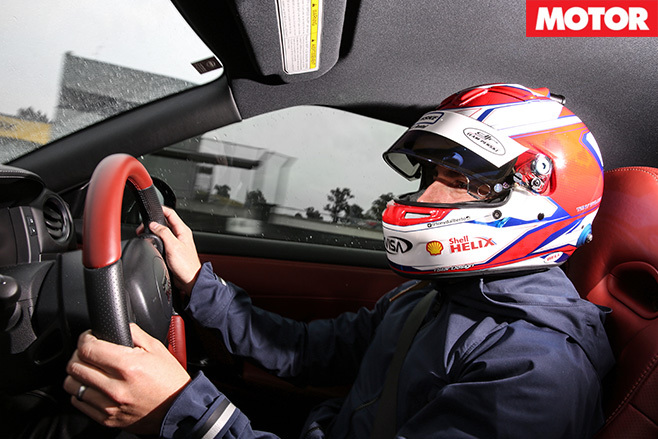 The Nissan should be pretty handy for overtaking too; 80-120km/h took just 1.5 seconds. That’s serious roll-on squirt, kids. Getting around the track became a game of catch and toss, but I’d still have to say the actual level of grip was astonishing for a track that the stewards had rated as V.F. Wet. It’d probably be even better if you could be bothered backing off the coilovers and dampers to a more subtle setting, but finding somebody who wanted to lie under a wet car on the wet ground turned out to be impossible. Can’t say I blame them. As it is, then, the GT-R is very stiff corner-to-corner, but at least that means it will four-wheel-drift, rather than simply push the front or rear end wide. Up the ante with more gas and it will definitely start to oversteer, which is entertaining if not surprising. So the shot is to use that surprising amount of front-end grip to get the Nissan turned-in. Once it has started to rotate you can then hang it off the front axle and marvel at how the hell it’s hanging in there at all. The other thing to consciously do is use a gear higher than you would in the dry. Do that, and, again, you’ll be amazed at how much throttle you can dial in before the tyres throw their hands in the air and it’s all over. The fact that you could actually get some pace out of the Nissan on such a slick surface actually made it one of the more fun cars to drive on the day. And I know that sounds silly: of course a 10-second car is going to be fun! But experience has taught me that when it’s as wet as it was on the day, sometimes it’s the slower, less explosive cars that are the most fun to punt. But not this time, and that surely points to a car that is a well-rounded package. For the few seconds the track was dry, D’Alberto managed a 1.01:3sec. 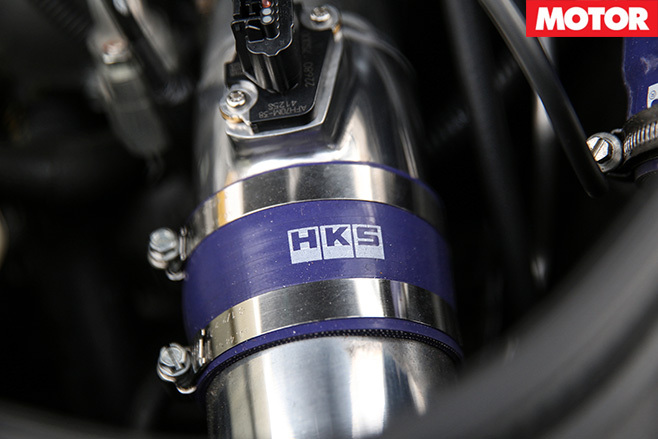 And that isn’t just fast, it’s a full two-and-a-half seconds better than anything else here – and that includes some very serious hardware. Hard to argue with that, so we didn’t. The big disappointment for me was – as it has always been – the transmission in the GT-R. As well as being a high-maintenance unit (the servicing regime increases dramatically the harder you use the car) it’s just not a very good attempt at refining a clutchless manual. Okay, okay, Nissan was one of the early adopters, back in 2009, when the GT-R first broke cover in Australia, but this, as Canadian PM Justin Trudeau has pointed out, is 2016. This aint Hi-Torque’s fault, obviously, but it does take a little shine off the car. Not that it was going to slow it down much. 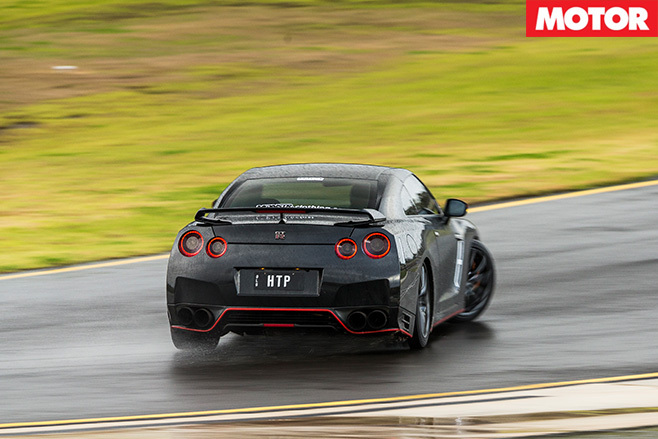 The Hi-Torque GT-R’s performance is on another level – another planet – and dry or wet, fuel issues or otherwise, was always going to get the biggest ribbon. It’s our Hot Tuner 2016 winner. All hail the new king, we are not worthy.